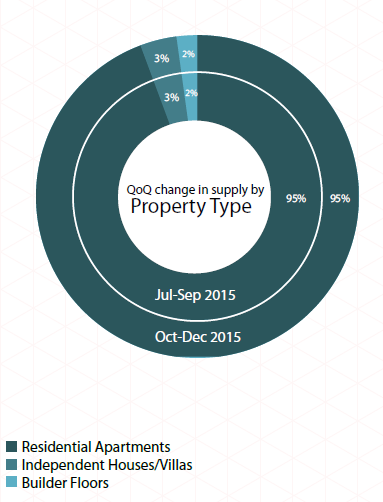 The last quarter of 2015 attested a stagnant property market, indicating a possible price correction in the future. The year which began on a positive note for Pune saw the graph declining for both demand and average capital rates due to crumbling customer sentiments and falling sales volume. Much like Bangalore, the presence of IT/ITeS and manufacturing industry was a saviour for Pune’s residential market, which is otherwise suffering due to negative market sentiments. The city witnessed some housing demand from end-users, while investors adopted a wait-and-watch policy. Despite the heavy discounts offered by developers that flooded the market this festive season, Pune’s realty graph failed to improve in Oct-Dec 2015. Increased enquiries and comparatively better sales volume infused some positivity in the market but were not enough to get the city back on the growth chart. Developers abstained from increasing property prices fearing customer withdrawal. Central Government’s initiative to revive Pune’s metro project in September 2015 uplifted consumer sentiments but there was an ambience of uncertainty and distrust among stakeholders regarding its timely execution. Pune Municipal Corporations’ (PMC) proposal to provide more TDR (Transfer of Development Rights) against land acquisition for the long-pending High Capacity Mass Transit Route (HCMTR) project is also anticipated to give a thrust to the residential market. If the plan gets approved, it would add a whopping 8,000 crore sq ft TDR for development in the city. The micro-markets expected to be impacted by the transport project are Hadapsar, Mundhwa, Salunke Vihar and Vishrantwadi among a few others. The proposal to hike the Floor Space Index (FSI) in older areas of Pune received mixed reviews. 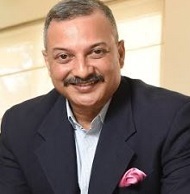 Where some of the industry stalwarts anticipate this to be a game changer for the city, some believe that it would not have any significant impact on the current situation of slowdown. In order to ease and speed up the process of acquiring building approvals, PMC announced a mobile application, wherein applicants can conveniently track and receive faster updates. Overall, the city saw multiple policy changes that could positively impact the market. 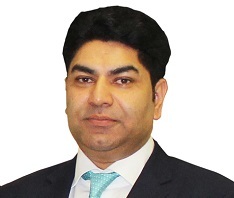 However, the current status of unsold inventory, collapsing customer sentiments and poor state of infrastructure in the peripheral areas kept the market grim and restricted the quarterly average growth in capital rates to zero. Though Pune’s residential real estate market remained stagnant in Oct-Dec 2015, as against the previous quarter, almost half of the localities tracked recorded positive price movement. With focus on the ‘Make in India’ campaign, Pimpri Chinchwad, which boasts of a flourishing manufacturing hub, emerged as one of the most coveted investment zones in Pune. 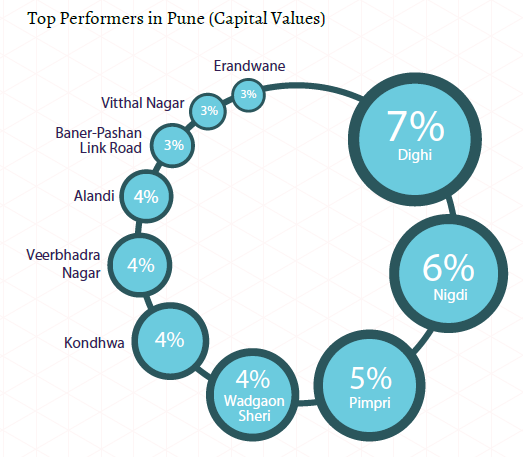 Three of the top ten best-performing localities namely Dighi, Nigdi and Pimpri were from the Pimpri Chinchwad Municipal Corporation (PCMC) region. In addition to healthy investment prospects, these localities offered properties at comparatively lower prices than those around central business district (CBD) and IT zones. Dighi was the top-grosser with seven per cent quarterly price appreciation. However, experts opine that this was more of a price corrective phase, as the locality witnessed a nine per cent decline in Jul-Sep 2015. 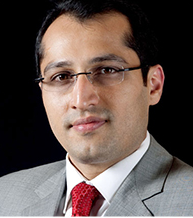 Quarterly growth in affluent locations such as Senapati Bapat Road, Kalyani Nagar, Bhosle Nagar, Prabhat Colony, Model Colony and Sopan Baug restricted to one or two per cent each. Overpriced property and low demand for the uber-luxury category were the primary reasons. Premium areas such as Koregaon Park and Magarpatta recorded negative price movement because of few takers for exorbitant projects in these localities. Alandi recorded four per cent increase in prices in the last quarter of 2015. It scored on its affordability over Viman Nagar, located just 5 km away. A 1000 sq ft apartment in Alandi would cost around Rs 50 lakh, whereas in Viman Nagar, it costs around Rs 70-80 lakh. Demand for office space in Pune remained buoyant during the entire year. Reports suggested that the western part, especially Hinjewadi, continued being a favourable office space destination amongst occupiers and thus witnessed healthy housing demand. Native home buyers in Pune have always been keen on owning a property, rather than renting one. The rental market has been majorly driven by the floating population driven to the city on account of the budding IT/ITeS and manufacturing industries. 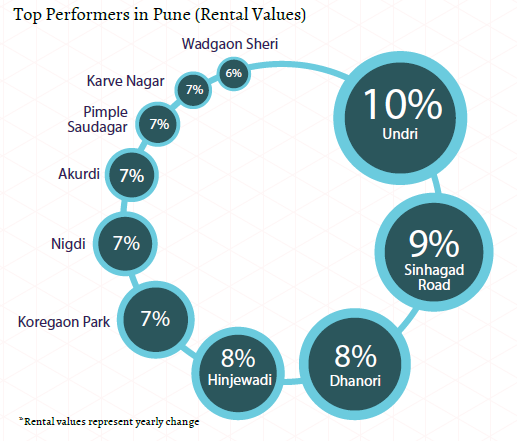 Though the city enjoyed robust demand for rental properties, availability of surplus ready-to-move-in inventory in almost all parts of Pune led to stagnant rental rates between Oct-Dec 2014 and 2015. Affordable localities around the fringes of the city, such as Undri and Sinhagad Road topped the preference chart of home seekers, thus recording a nine to 10 per cent hike in rental values in the last one year. While Undri is famous among those working in East Pune, Sinhagad Road is preferred by migrants working in West Pune. Rental markets of prime localities such as Viman Nagar, Sopan Baug and Aundh were hit by inflated ‘ask’ rates by the landlord community. Preference for economical rental options shifted buyers to neighbouring areas offering ‘value for money’. 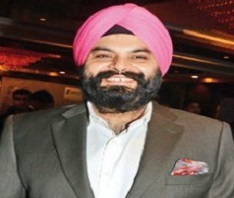 Dhanori, for instance, recorded an eight per cent hike in rental values in the last one year. The locality is at a distance of about 5 km from Viman Nagar and offers properties at almost half the rental cost. While a 1,000 sq ft apartment in Dhanori can be rented out for around Rs 14,000-15,000 a month, a similar apartment in Viman Nagar is available for around Rs 22,000-24,000 a month. Lack of new residential developments earned Koregaon Park a moderate hike of seven per cent in yearly rentals. The IT hubs, Hinjewadi and Magarpatta, too recorded robust housing demand, leading to an eight and five per cent increase, respectively in rental values. Catering to an influx of professionals in the growing IT/ITeS and manufacturing hubs, Pune has a demography much similar to that of Bangalore. With majority home buyers being end-users, demand for residential apartments is exceptionally high. Supply has continued to be in line with the market preference. Over the last two quarters, residential apartments captured almost the entire market share with 95 per cent availability. The inherent convenience and security attached with residential apartments made them a popular choice amongst youngsters and small families alike. Independent houses/villas were only three per cent of the total inventory. 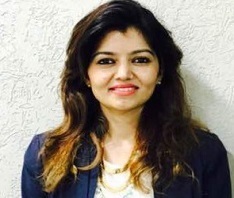 As per experts, they were commonly preferred by the top-management of the IT companies, city-based businessmen and investors from Mumbai. Majority of these units were priced above Rs 1 crore and the cost went as high as Rs 5 crore. Similar to the previous quarter, the high-income housing category (Rs 60 lakh – Rs 1 crore) recorded maximum supply in Oct-Dec 2015, as against the previous quarter. 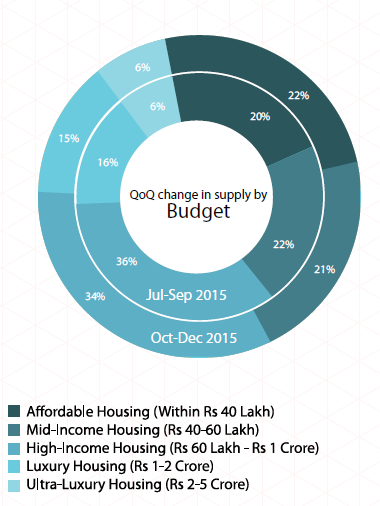 However, its availability dropped marginally owing to increased focus on low-cost housing. One of the main demand drivers of the Rs 60 lakh-Rs 1 crore budget bracket are buyers from Mumbai who aspire for premium homes within this price range. In Mumbai, one can only seek a 1BHK or a compact 2BHK apartment within this budget, whereas, in Pune, even a 3BHK can be bought within this budget. The affordable housing category (within Rs 40 lakh) recorded a surge in supply and stood at 22 per cent in this quarter. This bracket is the most easily absorbed and therefore, has now become the focus of developers. 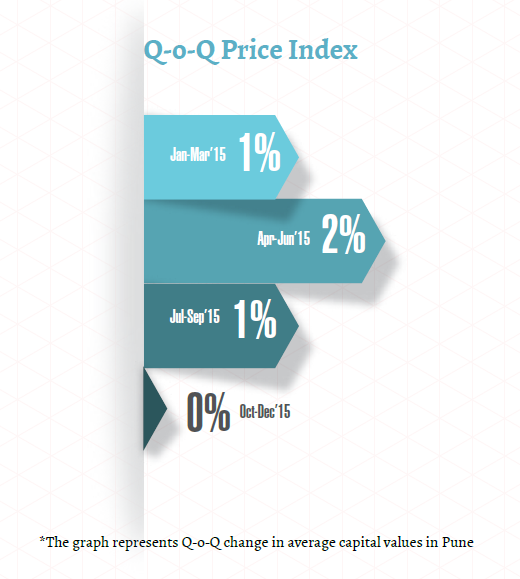 Out of the total inventory of residential apartments in Pune, about a quarter fell in the affordable category. Localities such as Wagholi and Moshi were the front-runners in the supply of properties priced within Rs 40 lakh. The mid-income housing (Rs 40-60 lakh) and luxury housing (Rs 1-2 crore) segments recorded a marginal dip in supply of their respective inventories. While the mid-income housing comprised only of residential apartments, independent houses/villas constituted about a tenth of the luxury housing segment. The penchant for affordable housing led to a marginal hike in supply of smaller homes configured as 1BHK units. With construction and labour costs going out of the bound, developers considered reducing the property sizes and configurations to provide low-cost homes. Due to growing demand for affordable housing, experts anticipate a budding market for 1BHK units in the coming time. 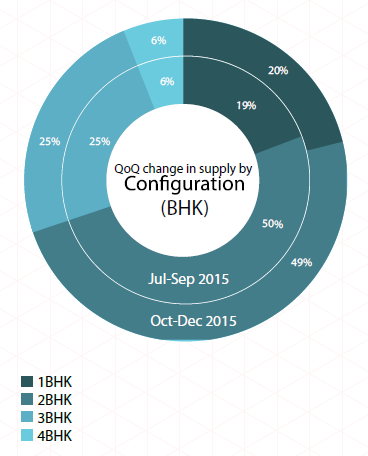 Despite a slight decline in supply, 2BHK units continued to capture almost half of the total market supply. While almost half of the total 2BHK units in Pune fell in the high-income housing category, about one-fourth were belonged to the mid-income housing segment. 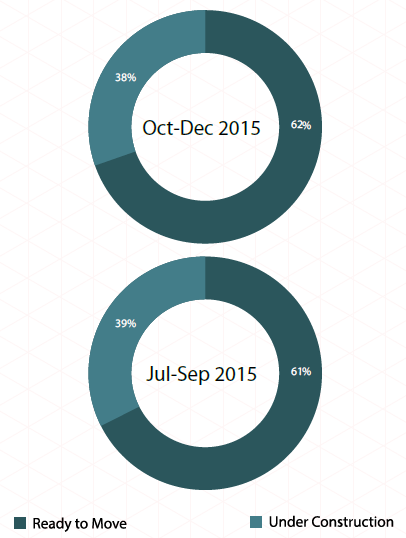 Supply of larger homes configured as 3BHK and 4BHK units remained stagnant between Oct-Dec 2015 and Jul-Sep 2015. The 3BHK units captured a quarter of the total market share. The overall supply of 4BHK units remained limited to six per cent this quarter, out of which more than a tenth were available as independent houses and villas priced beyond Rs 2 crore. Cost of 3BHK independent houses and villas was comparatively low. Majority of these units were available within Rs 1-2 crore (luxury-housing segment). Being afflicted by similar buyer sentiments as seen across the country, developers in Pune kept away from launching new projects and focused on completing the ongoing ones. Inventory of ready-to-move-in properties swelled up marginally in the quarter ending December 2015, standing at 62 per cent. There were some project deliveries in the affordable segment (within Rs 40 lakh) and mid-income housing segment (Rs 40-60 lakh) in Oct-Dec 2015, leading to an overall rise in the supply of ready-to-move-in properties. While the overall share of under-construction properties dipped in the current quarter, there was a significant rise of about five per cent in supply of under-construction affordable homes between Oct-Dec 2015 and Jul-Sep 2015. Out of the total homes being constructed in the affordable housing bracket, majority were supplied as 2BHK units, closely followed by 1BHK units. Commenting on price correction, Karandeekar said the high price of land would not make it possible. “The Pune market is dominated by small to medium scale builders who mostly acquire land through joint venture with the land owners. They are not able to reduce property rates as it would affect their profitability,” he said. Affordable localities in Pune – where can you buy in Rs 30 lakh?